UH Sports Circle of Honor inductee Jim Leahey called that game for KHNL. Most UH football fans still remember the score: 56-14. But a closer examination of the game reveals even more telling numbers that show just how dominant the Rainbow Warriors were against their arch-rival. Take a look. 10 – The amount of consecutive losses Hawaii suffered at the hands of BYU entering the game. 4.5 – The number of points BYU was favored to win the game. 46,841 – The number of fans who attended the game (turnstile count). 156,898 – The number of fans who claim to have attended the game (writer estimate). 2 – The number of Hawaii broadcasters (Rick Blangiardi and Larry Beil) who accepted job offers on the mainland but stipulated that they had to be available to work the UH-BYU game. 440 – Total passing yards by UH QB Garrett Gabriel (a new UH record). 158 – Receiving yards gained by Hawaii receiver Chris Roscoe (8 receptions). -55 – BYU rushing yards the UH defense allowed. Yes, minus. 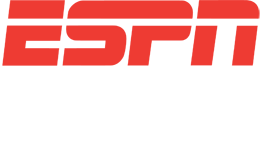 1 – Reception by UH running back Jamal Farmer. Unfortunately for BYU, that reception was an 83-yard touchdown. 2 – Interceptions by UH safety Walter Briggs. 3 – Number of future NFL players in Hawaii’s starting line-up. (Jason Elam, Larry Goeas and Jeff Sydner). 21 – Consecutive points UH scored before BYU got their first score. 35 – Consecutive points UH scored after BYU got their first score. 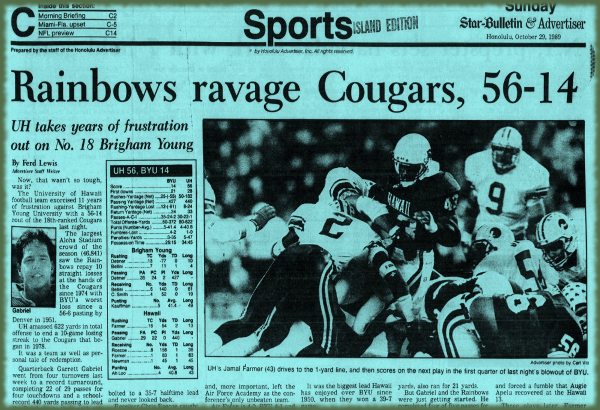 10 – The amount of times the Rainbow Warrior defense sacked Cougar QB Ty Detmer. 72 – Total points allowed by the Cougars in their four previous conference games. 5 – Number of times the UH men’s basketball (3) and baseball (2) teams beat BYU in 1989. It was a good year for Hawaii against the Cougars!